The ICED facility supports the delivery of DFID’s Economic Development Strategy. 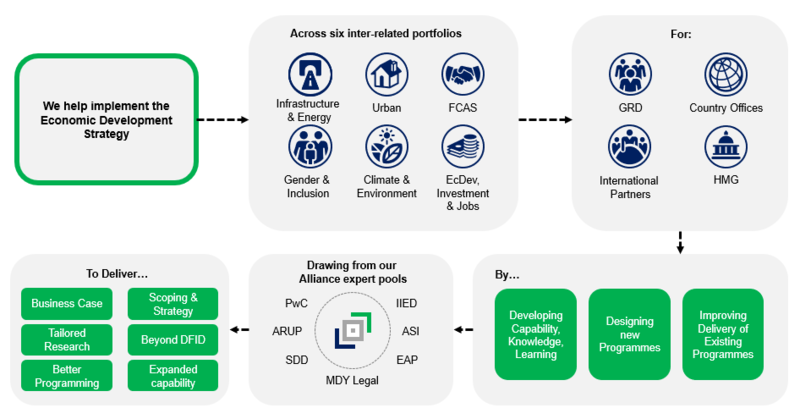 We do this by offering support across six interrelated portfolios: Infrastructure & Energy, Urban, Fragile & Conflict Affected States (FCAS), Gender & Inclusion, Climate & Environment, and Economic Development, Investment, & Jobs. Country and regional offices and DFID programme design advisers can access a range of rapid technical assistance from a pool of experts as well as research, policy briefings, consultations, support for business cases, and scoping & strategy.